Set sail on New York Harbor while enjoying the many pleasures of the world of craft beer! 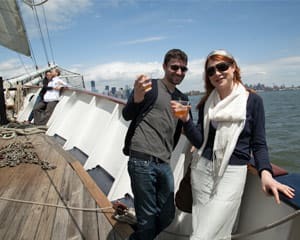 Aboard the only-of-its-kind tall ship on New York Harbor, you’ll be treated to the varied tastes of craft beers, courtesy of the fine folks at Urban Oyster tours. Taste several outstanding ales and lagers while you drink in the magnificent views of the skyline of NYC. The vessel is the topsail schooner Clipper City, whch is a 158-foot steel replica of a 19-th century sailboat. The only difference is this boat was made with the modern passenger in mind. You’ll be afforded impressive vistas and unrivalled views thanks to the raised quarter deck back. Learn the fascinating history of beer, sailing and NYC. Set sail on New York’s largest sailing vessel with the craft beer experts from Urban Oyster, and be introduced to the wonderful, reinvigorated world of craft beer while enjoying breathtaking close-up views of Lady Liberty and the Brooklyn Bridge.